Published: Nov. 4, 2018 at 06:18 p.m. Published: Oct. 28, 2018 at 03:27 p.m. 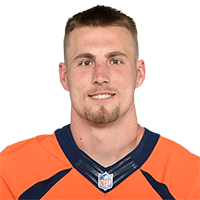 Published: Oct. 15, 2017 at 11:33 p.m.
Denver Broncos quarterback Trevor Siemian fired to tight end Jeff Heuerman for 13-yard touchdown against the New York Giants.